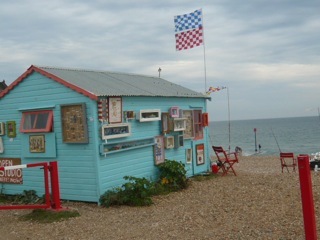 Peter Quinnell and Clare Fletcher are seasoned exhibitors for Coastal Currents at their beach hut in West St Leonards. Their bright turquoise hut with the metal corrugated roof is a favourite haunt for art lovers with a sense of humour. 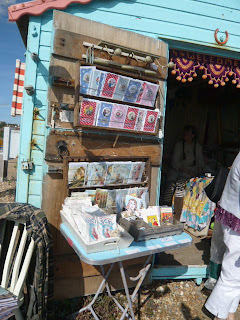 In a strange way their hut reminds me of Alice and wonderland, crammed full of eccentric madness . One almost expects the rabbit to rush through with his time clock obsessed with his lateness screaming "I'm late .I,m late. 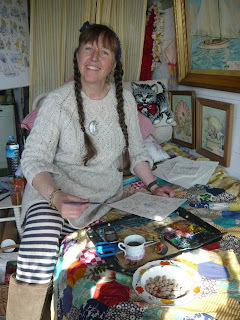 Even Clare, her smile warmly greeting all visitors, resembles Alice with her enviously long plaits sitting on the bed drawing non stop illustrations that once ignited our imagination in the books of our childhood. 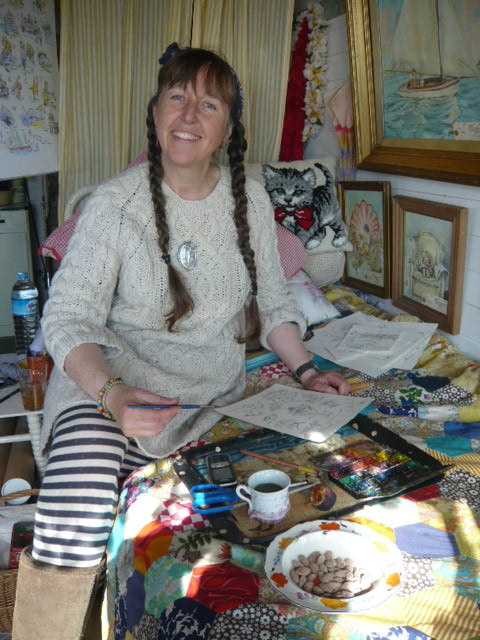 Clare's work is of another generation , when gentle water colours and figurative drawings mirrored the story in the book and not a computer in sight. 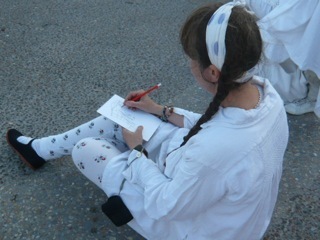 A brilliant illustrator. These are not precious artists , they expect and rely on the sales of their work and they are proud of their work ethics . Not for them the elitist world of the hidden art gallery that you need a pedigree to enter . Peter Quinnell,s boxes are almost box theatres full of humour a story within appealing to all ages. An obvious hoarder of memories that still haunt him re Fonzie. Even his attire is uninhibited but never vulgar , an eye for the unusual or even the obvious , a greed for colour, he almost grabbed my fair isle sweater that I purchased years ago for £4 at St Michael's Hospice...but it stayed on my back even if it is slightly eaten by moth .A wonderful couple that bring to life the creative energy of St Leonards. ......yes I know they live in The Old Town but they make a presence wherever they are .